The motocross tyres range that you can find at giga-tyres.co.uk is here to help you boost the performance of your vehicle. These wheels have been designed for high speeds and sharp turns. 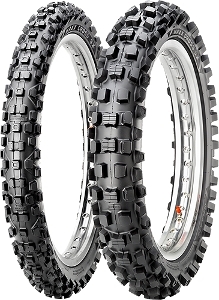 From motorcycle tyres to motocross wheels, bike tyres and even scooter tyres, you will find a massive selection of brand name tyres here. From Bridgestone to Dunlop, Continental and Pirelli, select whichever brand you prefer and know that these brands have gone the extra mile to deliver the quality that you deserve. This is also true of the Enduro tyres, which are offered here, too. Check out the racing, sport touring radial, sport touring diagonal, supersport road and moped along with quad wheels.